There are new views all over the Grand Canyon University campus as summer construction makes room for new and returning students. But none is more striking than the panorama from The Grove, the new cluster of four residence halls that anchors the northwest corner. Juniper Hall, one of four six-story residence halls at The Grove, towers over the new sod between the four buildings. The massive expanse of The Grove, the most ambitious construction project GCU ever has undertaken, and its six-story structures are even more impressive up close than they are from Camelback. Resident directors and advisers already are preparing for approximately 3,000 freshmen — among 7,000 new students this fall — who are moving into The Grove starting Monday, when Welcome Week begins. 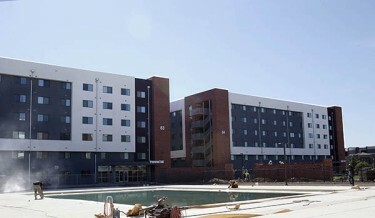 The Grove’s Juniper Hall will be the new home of 250 of the 750 students in GCU’s Honors College. How is The Grove shaping up? The last of the furniture, in Juniper Hall, recently was installed, as was a new wide sidewalk that leads toward campus. A pedestrian crossing at the Loop Road soon will be in place. But the best piece of news for students, no doubt, is that the pool is filled with its 128,000 gallons of water and should be ready for them to make a splash. Lined on the north side by a grove of palm trees, the pool area also will feature barbecue pits and chaise lounges. It figures to be a popular hangout area for residents, as will the other two pools on campus, at Chaparral Hall and Papago II. The latter will host the Canyon Cool Down from 7:30 to 9 p.m. Monday. Workers put the finishing touches on the 128,000-gallon pool at The Grove. Scheduled to be installed soon at The Grove are a jogging path of foot-friendly decomposed granite, basketball courts and two artificial-turf intramural fields. What will there be to eat on campus? Most of the new food outlets on Lopes Way are scheduled to be open Monday. That includes Qdoba, Einstein Bros Bagels and Jamba Juice in the Student Union, Panda Express and another Peet’s Coffee & Tea in Camelback Hall, the Lopes Mart in Chaparral Hall and Zoyo Neighborhood Yogurt in Thunder Alley. The new Slices Pizza in the Student Union is expected to open Tuesday, Subway (Prescott Hall) is on the schedule for Wednesday, and Chick-fil-A in Prescott and The Grid convenience store in Camelback should be ready for customers Thursday. For the first day of classes (Monday, Aug. 24), a new pasta station in Thunder Alley is scheduled to be unveiled along with two new options in the Union — Habit Burger and the Urban Center Café (comfort food) — and a popular holdover from the old cafeteria, the Mongolian 360 Grill. Zime, billed as “a totally modern bakery-café brand that offers nutritious meals,” is set to open Aug. 29 in Thunder Alley, and the convenience store in The Grove’s Juniper Hall is planned for a mid-September start. There also will be about a half-dozen food trucks between Prescott and Tell Science Building at lunchtime Monday through Friday next week. They will be cash or credit only — no swipes of GCU meal cards. How’s Lopes Way coming along? The new outdoor dining hub in the middle of campus is now paved with bricks, and the eating areas are being installed. If the heat is too much to eat outside, most of the eateries will have a limited number of tables indoors, and diners always will have the option of using the Student Union’s north dining hall — one of the advantages of the new food setup. In the old days (last spring) only people who paid to eat in the cafeteria could use that facility. 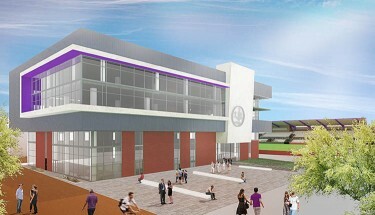 Artist’s rendering of the four-story office building that is being built in the middle of campus. The new soccer stadium is in the background. Where are basic student services located? The first floor of Hegel Hall, just north of the Student Union, is the new go-to place for Student Engagement, Spiritual Life and, eventually, Student Disability Services while a four-story office building is being built on the site of the old pool on the Promenade. Staff from buildings 1 through 5 and the portable modular buildings on the southwest side of campus are moving to Hegel, and in October their former offices will be demolished to make way for a second engineering building. Career Services is temporarily on the south side of Saguaro Hall, and Residence Life is still in Papago I for now. The upper floors in Hegel will be used for Discover GCU. Student identification cards may be obtained at the New Student Orientation Expo, scheduled for 10 a.m.-5 p.m. Monday through Friday in the LPC and 11 a.m.-3 p.m. Saturday in CAS (Building 6). 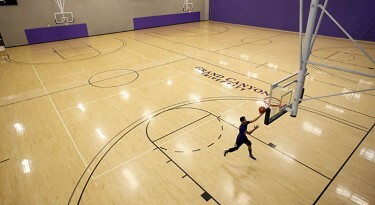 The Lopes Performance Center is available to students and staff at designated times. What workout facilities will be available? Starting Monday, Aug. 24, the LPC will feature one-hour boot camps at 12:30 p.m. Monday through Friday and 6 p.m. Tuesday and Thursday. Another new feature is that students will have access to the Performance Athletic Center 2 (the weight area upstairs) from 8 p.m. to midnight Monday through Friday and noon-8 p.m. Saturday and Sunday. The LPC basketball courts will not be available during Welcome Week. After Labor Day, courts 1 and 2 will be reserved for intramural volleyball from 5:30 to 11:30 p.m. Monday through Thursday. Open-gym basketball is from noon to 1:30 p.m. Monday through Friday and all day Saturday and Sunday, and the courts also will be available when the men’s and women’s basketball teams and the cheer squad aren’t using them. Students also have access to the fitness centers in Chaparral Hall and on the second floor of Papago II, and coming soon is the new fitness area in Juniper Hall. Where can students and their parents buy purple T-shirts and other GCU items? The new Lope Shop in Prescott Hall is expected to open sometime next week. But until then, there will be plenty of GCU gear available — clothing, water bottles, mugs, lanyards, etc. — in a temporary location outside the Arena as well as the Team Shop inside the Arena. What’s happening with GCU library? 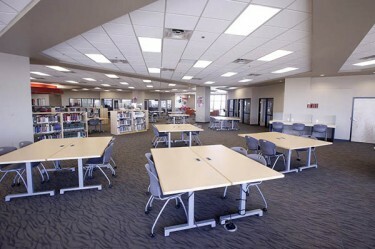 However, its resources are available anytime at library.gcu.edu, and students can get research help from Ask a Librarian. The new Grove Garage, directly west of The Grove, opened Thursday morning. It’s for students only and will house Public Safety, scheduled to move into its new first-floor office during Welcome Week. To allow families and students to park in the other two campus garages — on 35th Avenue and on Camelback Road — GCU employees have been directed to park in the lot at 27th Avenue during Welcome Week. Shuttles will be running regularly to the campus. What’s new with Public Safety? 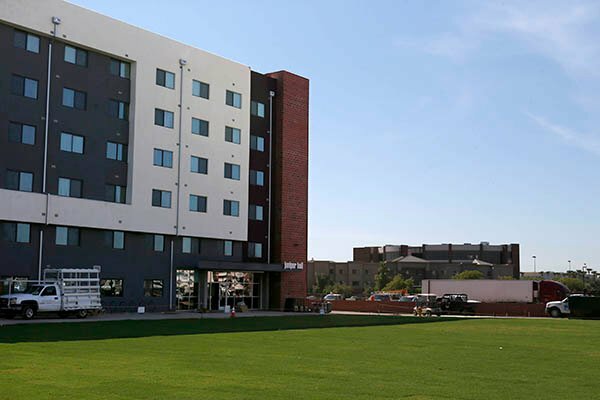 Its staff has grown to 155, and it has taken over security operations at GCU Arena and the new Grand Canyon University Hotel. In addition, Public Safety staffs all open entrances to campus, provides security at all athletic events and conducts around-the-clock general patrols. The lobby of the new office will be open from 8 a.m. to 5 p.m., but Public Safety is available 24/7 by calling 602-639-8100. Public Safety Week is scheduled for Aug. 31-Sept. 4. Are there rooms available in the new GCU Hotel? The hotel, located next to the 27th Avenue office building, is full for Welcome Week. With its $69 room rate and easy access to the University, it quickly has proved to be a popular option for parents and guests. The hotel number is 1-84-HOTELGCU (1-844-683-5428) to check for Welcome Week cancellations or to reserve a room for a future visit. What if someone needs the Health and Wellness Center? Even returning students might not know it has moved, too — its new, improved quarters (20 percent larger, more patient-care areas) are in Papago I. Like Public Safety, the Center has expanded its staff. It has three additional counselors, one more nurse practitioner and an extra medical assistant. Another new feature this year: Medical appointments may be scheduled online beginning next week. GCU employees can use the center, too, for all their medical needs, including prescriptions. An open house is scheduled for all day next Thursday, and refreshments will be served. New students’ walk-throughs during Welcome Week will include the Center. The Center is closed daily for lunch from noon to 1 p.m. And it will be closed from 8 a.m. to 1 p.m. next Wednesday only. It used to be in Building 9, which was demolished to make way for the new soccer stadium. It’s now in Papago II. Speaking of the soccer stadium, how’s that coming along? 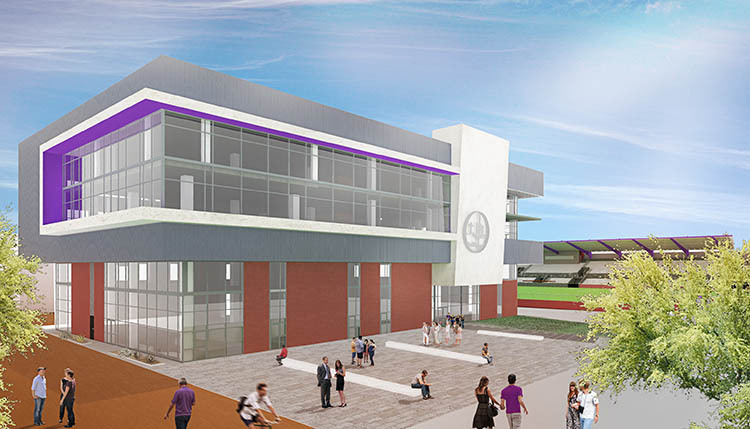 The wall for the stands with a huge “GCU” chiseled in is up, and so are the brick walls that will surround the swanky new stadium just east of Antelope Gym. It is expected to be done before the end of the year. Finally, what are the biggest events of Welcome Week? An informal sand volleyball tournament is planned for Friday during Welcome Week at GCU. Friday: Informal tournaments from 5-9 p.m. for dodgeball in Prescott Field (formerly the intramural field, now covered with artificial turf) and sand volleyball just south of Antelope Gym, plus the women’s soccer home opener with the first “March to the Match,” beginning at the east end of Lopes Way at 6:15 p.m. The Havocs, GCU’s spirited student section, will lead the way to the soccer field for the 7 p.m. match against Northern Arizona. Saturday: Women’s volleyball scrimmage, 6 p.m., Antelope Gym, and Phillip Phillips concert, 8 p.m., Arena. Students can obtain concert tickets at the Arena box office. GCU faculty and staff can request up to four free tickets to the concert, and have their names placed on a waiting list by emailing gcuarenaticketing@gcu.edu with the subject line “Phillip Phillips Overflow” and include their name, phone number and number of desired tickets, up to four. At noon on concert day, tickets that have not been claimed by students will be allocated to employees on the list, first come, first served. They will be notified via phone if they have received tickets. But the first step for the arriving students and their parents will be driving into campus and getting a boisterous welcome from the throngs of purple-shirted luggage toters. That’s the best view of all.